We investigate the effects of semantically-based crossover operators in genetic programming, applied to real-valued symbolic regression problems. We propose two new relations derived from the semantic distance between subtrees, known as semantic equivalence and semantic similarity. These relations are used to guide variants of the crossover operator, resulting in two new crossover operators—semantics aware crossover (SAC) and semantic similarity-based crossover (SSC). SAC, was introduced and previously studied, is added here for the purpose of comparison and analysis. SSC extends SAC by more closely controlling the semantic distance between subtrees to which crossover may be applied. The new operators were tested on some real-valued symbolic regression problems and compared with standard crossover (SC), context aware crossover (CAC), Soft Brood Selection (SBS), and No Same Mate (NSM) selection. The experimental results show on the problems examined that, with computational effort measured by the number of function node evaluations, only SSC and SBS were significantly better than SC, and SSC was often better than SBS. Further experiments were also conducted to analyse the perfomance sensitivity to the parameter settings for SSC. This analysis leads to a conclusion that SSC is more constructive and has higher locality than SAC, NSM and SC; we believe these are the main reasons for the improved performance of SSC. This paper was funded under a Postgraduate Scholarship from the Irish Research Council for Science Engineering and Technology (IRCSET). The authors would like to thank the members of NCRA (Natural Computing Research & Applications Group) at University College Dublin. The second author was partly funded by The Vietnam National Foundation for Science and Technology Development (NAFOSTED) under grant number 102.01.14.09 for doing this work. R. Poli, W.B. Langdon, N.F. 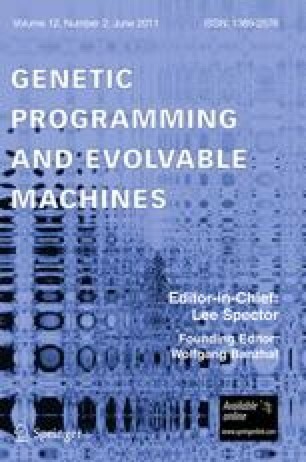 McPhee, A Field Guide to Genetic Programming. Published via http://lulu.com and freely available at http://www.gp-field-guide.org.uk, 2008. (With contributions by J. R. Koza).